French statesman; opponent of Jewish emancipation; born at Paris, 1757; beheaded in 1794 for intriguing against the French Revolution. He wrote "Opinion sur l'Admission des Juifs à l'Etat Civil" (Paris, 1791), in which he argues against the admission of the Jews into French citizenship simply because the reformed Jewish oath is sufficient proof of the complete renunciation of the rights of citizenship. De Broglie found a vigorous and bitter opponent in the representative Prugnan, who signally defeated his exclusion bill (Sept. 27, 1791). 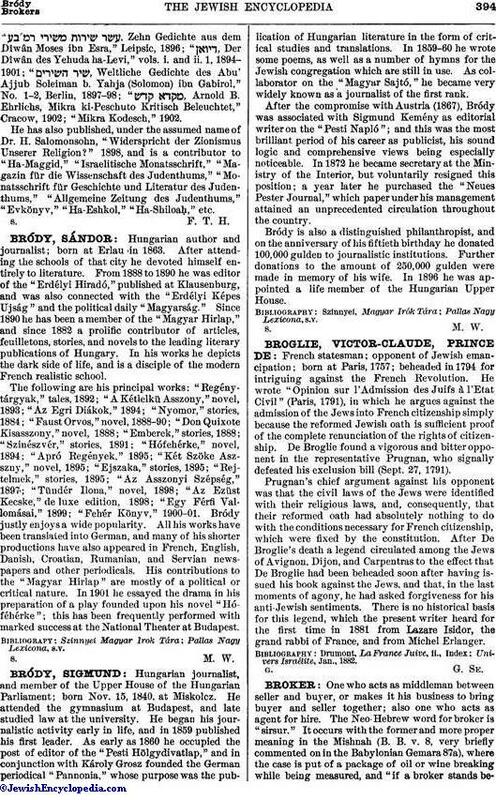 Prugnan's chief argument against his opponent was that the civil laws of the Jews were identified with their religious laws, and, consequently, that their reformed oath had absolutely nothing to do with the conditions necessary for French citizenship, which were fixed by the constitution. After De Broglie's death a legend circulated among the Jews of Avignon, Dijon, and Carpentras to the effect that De Broglie had been beheaded soon after having issued his book against the Jews, and that, in the last moments of agony, he had asked forgiveness for his anti-Jewish sentiments. There is no historical basis for this legend, which the present writer heard for the first time in 1881 from Lazare Isidor, the grand rabbi of France, and from Michel Erlanger.